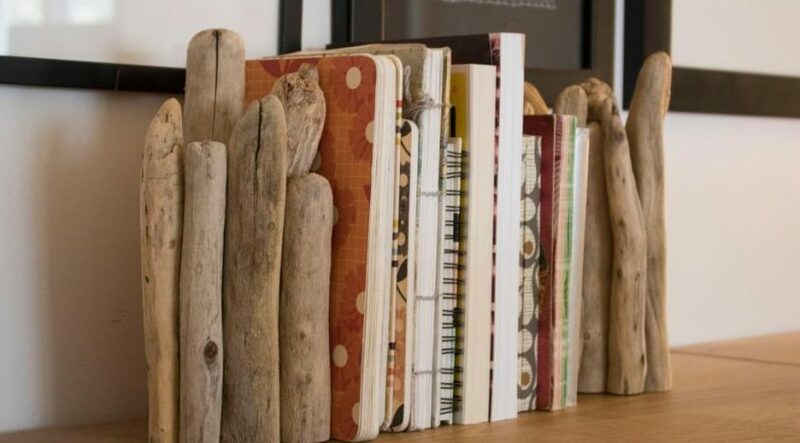 Achieve total beach house vibe by cutting 10 pieces of driftwood in half and assembling the pieces — flat end down — to form a set of coordinated bookends. Hot glue will be strong enough to hold these light pieces of wood together, but when grouped, they’re heavy enough to hold your reads upright. Laura Seymour, maker of macrame art at Hitch + Cord, builds her masterpieces upon collected pieces of beach driftwood. Have a special piece that you want to feature in your home? Learn how to craft your own woven decor (or mail it to Laura; I’m certain that she’d be honored to create a custom piece that pays homage to your special finds). Did you find a big piece of driftwood on the shore? It might be the perfect piece for a homemade clock. Purchase a clock hardware kit with a thread long enough to extend through the driftwood and assemble a one-of-a-kind timepiece in minutes. Bonus points if you collected enough beach glass on your trip to assemble the clock numerals! A collection of branches big and small can be mounted to a large frame. Opt for a strong adhesive to bond the branches to one another (make sure it’s a weather-proof adhesive if the frame will be installed outdoors), but rely on hot glue to pin it in position while the stronger adhesive cures. 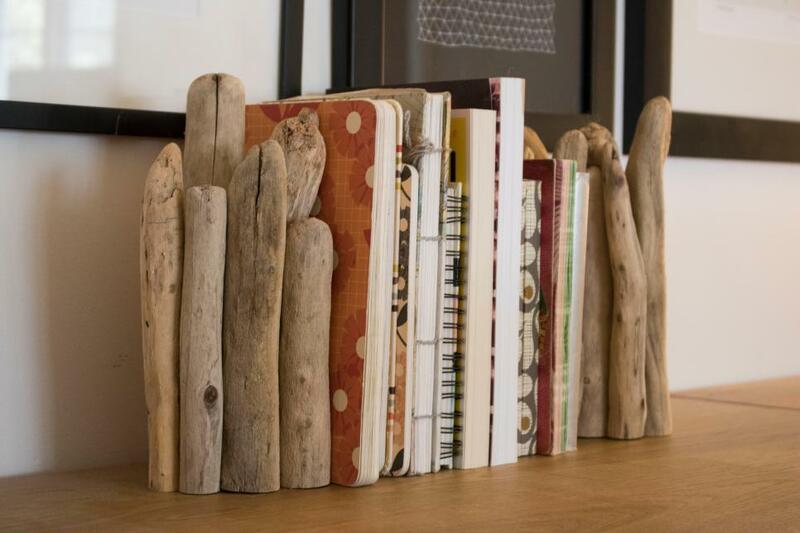 Use a saw to trim off the end of a piece of driftwood to transform it into a functional coat hook. You can either route into the cut end with a keyhole bit or predrill a narrow hole, saw the head off of a nail, and use adhesive to secure the cut nail into the driftwood. Add these hooks to your entryway for decoration and as a replacement for a traditional coat hook. Create a keepsake from your beach vacation using a small piece of driftwood, thread and all of the beach glass bits you collected from the shore. Instead of storing all of those treasures in a drawer, you’ll have some eye-candy for the walls to remind you of that special trip. Nails with a wide head can be tapped into a piece of driftwood for easy, minimalist necklace storage. Add a dab of paint to the end of the nails for extra color. Drill holes in each end to thread rope or string for hanging. Level up your collection of wooden beads with tokens from your beach vacation. Trim a narrow piece of driftwood into 1/2″ lengths. Then use a 1/16″ drill bit to make a hole through the center of each piece to transform it into a bead. Let the kids accent the natural wood with paints or stains. Thread the beads onto necklaces and bracelets and bask in the joy of easy summertime crafting.